Western Cape Police have confirmed that two people have been arrested in connection with the violent protest march which took place at Cape Town CBD on Wednesday. Many stalls were looted and windows of shops destroyed while people were protesting for better service delivery in their communities. Police Spokesperson Andre Traut said two men were arrested, one was arrested for possession of stolen property and the one for damage to property. He also said they will appear in court once they have been charged. Meanwhile the South African Communist Party has joined many organizations in condemning the violent protest. SACP District Secretary Benson Ngqentsu has called for the Western Cape government to take full responsibility for the chaos which erupted on Wednesday. Ngqentsu said Premier Zille should take full responsibility for everything that happened on Wednesday, but the SACP strongly condemns the looting of shops and stalls. He added that there is a strong belief that the march was disturbed by people who came with their thuggish intentions. Netcare 911 paramedics today responded to an accident scene in Midrand whereby one person died and two were left injured. Netcare 911 Spokesperson Santi Steinmann said upon their arrival on scene they found that they found that two vehicles were involved in the accident and one man had lost his life. Steinamann added that one person had sustained critical injuries and other one sustained moderate injuries, they were both treated on the scene before being transported to a nearby hospital for further care. The Red Cross War Memorial Children’s Hospital today launched the Bone Anchored Hearing Aid programme. Western Cape MEC of Health Thenus Botha said providing support to children with disabilities that can improve their opportunities in life, is the vision of government. During the launch four children were fitted with the device that will allow them to have a near-normal hearing. Spokesperson for the Red Cross War Memorial Children’s Hospital Lauren O’Connor-May said the bone hearing aid are given to people that are having an impact in function cochlea but have hearing difficulties because the sound can not get into the cochlea. She added that are various reasons why the sound can get into the cochlea, such as the child might have been born without ear canals or the ear canals are blocked. The South African Democratic Teachers Union said it is shocked at the levels of violence in schools in the country. This follows the murder of a learner at a school in KwaZulu Natal, the incident was caught on camera. Sadtu Deputy General Secretary Nkosana Dolopi said the safety of both learners and teachers was one of the resolutions adopted after the union’s national general council which was held in Kempton Park over the weekend. Dolopi said the harshest sentences must be handed out to all those who have conducted themselves in unbecoming kind of way. The law enforcement agency must assist us to make sure that we maintain law and order at schools, but also to make sure that all those who are at school are safe and secure. “We are holding a firm view as Sadtu that learning and teaching can only take place in an environment conducive for such learning to take place” Dolopi added. The Congress of South African Trade Union has welcomed the prison sentencing of the Boeremag five on Tuesday to between five and 30 years imprisonment for high treason. The bombers had five large car bombs ready for targets in the city centers of Pretoria and Johannesburg and they were also planning further bomb attacks when they were caught. Cosatu Spokesperson Patrick Craven said many more lives could have been lost, more seriously the whole social fabric of South Africa would have been threatened by a group which wants to go back to the dark days of apartheid. “Hopefully this will serve as a deterrent to anybody else who thinks that they can use force to destroy the democracy in which we establish nearly 20-years ago” Craven added. Violent protest action which took place on Wednesday has been condemned by many including the African National Congress. About a thousand protestors from townships in Cape Town looted stalls and broke shop windows in protest for better service delivery. ANC says there is no justification for the criminal activity that occurred on Wednesday. ANC Councilor Xolani Sotashe said all leaders need to stand together in condemning this unruly behavior which is outside the norm of how South Africans must conduct themselves when protesting, which is guaranteed by our Constitution. “We believe that however is responsible for this action must face the full might of the law” Sotashe added. Meanwhile the Democratic Alliance has labeled the protest march as nothing more than grandstanding. DA Leader in the Western Cape Ivan Meyer said in light of the recent Constitutional Court ruling organizers of a march or gathering can be held liable for damage incurred by marchers. Meyer said the organizers of Wednesday’s protest march must be held responsible for the damage caused by looters. Ivan Meyer added that what happened was that many informal traders and small business entrepreneurs were targeted by the protestors, and their stalls were looted also small businesses lost thousands of Rands in stolen goods and lost of income. The DA has called on the police to make the necessary arrests regarding this matter. The African Christian Democratic Party said it welcomes the drop in unemployment figures in the country. ACDP MP Cheryllyn Dudley said they hope to see a sustained improvement impacting not only the economy but communities and individuals. “Education outcomes, insufficient job creation, labour market inflexibility, uncertainty over property rights and wastage and inefficiency in service and infrastructure provision are just some of the reasons unemployment has not been able to drop significantly over the past few years.” Dudley added. She concluded by saying the ACDP calls on government not to become complacent and to make the changes necessary to address the situation and ensure sustainability. 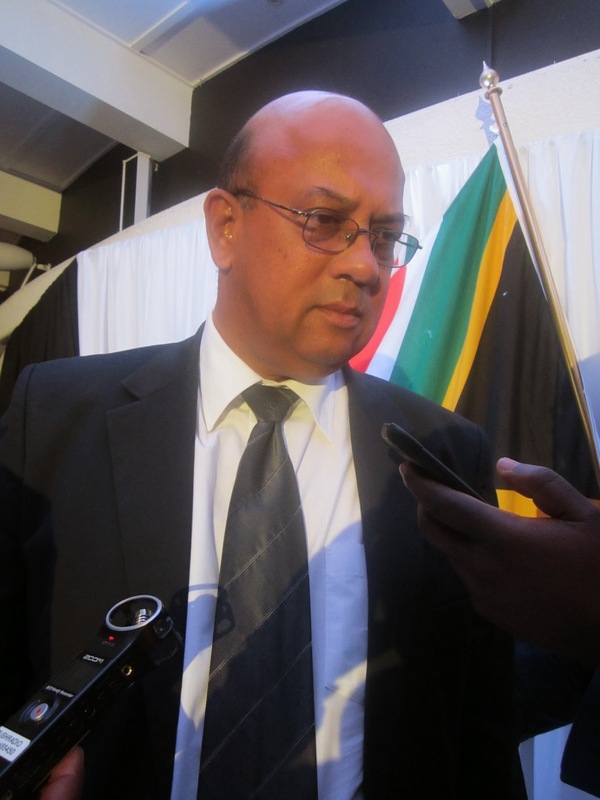 President Jacob Zuma will today hand over the permit of the Saldanha Bay Industrial Development Zone. 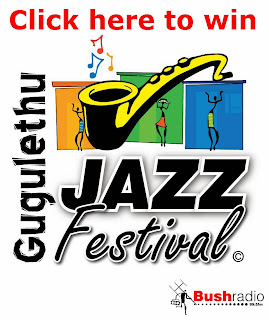 Western Cape Premier Helen Zille and MEC of Finance, Economic Development and Tourism Alan Winde will be in attendance. Winde said the permit will create 8 000 job opportunities in the province. “This is an opportunity that will create jobs, an opportunity for economic growth, an opportunity for not only Saldanha Bay or the Western Cape but for South Africa and sub- Saharan South Africa" Winde added. We really welcome this, we look forward to it and this is something that all spheres of the government has been working on for sometime now from Dti the national level to the provincial government and our agency Wesgro and the local authority and the municipality of Saldanha Bay,” Winde added. The Democratic Nursing Organisation of South Africa will today be picketing outside the St Mary’s Hospital in Durban in protest over non-payment of this year’s salary increase. Denosa Provincial Secretary Cassim Lekhoathi said they will also be demanding a forensic audit report at the hospital. Denosa is also calling on government to rescue and take over the hospital as management have not been able to do so. Lekhoathi added that St Mary’s Hospital is a state aided hospital together with the department of KwaZulu-Natal is funding the hospital for the salaries and the running of the hospital. “We are disappointed to have learnt that they do not have money to pay their salary increases for the nurses and general workers in total,” Lekhoathi said. The Minister of Police Nathi Mthethwa has called on South Africans to give the Independent Police Investigative Directorate the space to investigate National Police Commissioner Riah Phiyega. The commissioner has been accused of tipping off Western Cape Police Commissioner Arno Lamoer about investigations against him. Ministerial Spokesperson Zweli Mnisi said this mandate of policing the police is correct in the police force. He added that once investigation is finalised it will be sent to the Minister and then it can be taken to the public. The Minister of Economic Development Ebrahim Patel on Tuesday welcomed the judgment by the North Gauteng High court to dismiss an application to interdict the implementation of government’s new scrap metal export regulations. Patel said the judgment reaffirms the right of the executive arm of government to make policy decisions and directives that seek to create jobs. Ministerial Spokesperson Manelisi Wolela said government has an obligation to intervene in order to reverse the decline in the local fundraising which resulted in the last ten years. He added that this follows the issuing of policy documents by Minister Patel in May 2013. Cape Town township residents which include Khayelitsha, Gugulethu and Langa this afternoon gathered at the CBD and started looting stalls at St Georges Mall. The protestors are calling on Western Cape Premier Helen Zille to give them proper service delivery including decent housing and toilets. Former African National Congress Councilor Loyiso Nkohla said people across the country must not listen to Helen Zille, they must throw human waste on her and in her car and everywhere she goes. 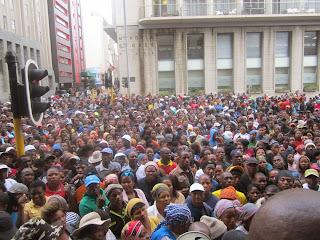 “Our demand is that we are human beings and we must be treated as such and our demands are real,” Nkohla added. Nkohla said today we came with more than 20 000 people that this is not about Andile Lile or Loyiso Nkohla but it is about the community and their demands for better service delivery for all. The African Christian Democratic Party in the Western Cape has welcomed the City of Cape Town’s investigation into tender irregularities and mismanagement at the city’s tourism and events directorate. As part of the investigation computers of staff members were seized. ACDP Provincial Leader Ferlon Christians said as the ACDP they are pleased with the confiscation of laptops of staff, including that of Grant Pascoe the Mayoral Committee for Tourism. Christians further called on the City to live up to its values to stand firm with clean government and if anyone is found to be doing some irregularities to be prosecuted. ER24 paramedics attended to an accident scene on the M3 in KwaZulu Natal this morning whereby a person died. A large truck carrying paper crashed down an embankment after crashing into a vehicle. ER24 Spokesperson Vanessa Jackson said when paramedics arrived they found a passenger who was trapped in the cabin of the truck. He suffered extensive injuries. “At the back of the truck paramedics found another passenger who was flung out of the wreckage and trapped underneath the truck with only his arm that was visible” Jackson added. ER24 Spokesperson Vanessa Jackson said it took paramedics 4hours to remove the man from the wreckage but sadly his condition rapidly deteriorated and they had to place him on life support, and he was transported to hospital in a critical condition. Sadly he died in hospital due to extensive injuries he sustained. The exact details of the cause of the accident will be the subject of a police investigation. The Durban Flying Squad Narcotic Drug team arrested suspects between 15 and 49-years-old for dealing in drugs in the Durban Central and Bayview area. Police Spokesperson Thulani Zwane said police recovered drugs to the street value of R3 260 plus R 2 920 in cash. Zwane said it is alleged that Durban Flying Squad Narcotic Drug team were patrolling the Chatsworth area when the information about the dealing of drugs in the area surfaced. “The suspects were arrested and police seized cocaine as well as heroin in their possession. The suspects appeared in court on Tuesday and will remain in custody until the next court appearance. The Congress of South African Trade Union in the North West said it is disappointed and shocked at the manner in which some employers are dismissing and retrenching workers in the Rustenburg area. Cosatu Provincial Secretary Solly Phetoe said there are allegations that some of the employers such as HJA distributors are retrenching workers for talking to a labour inspector during inspection day. Phetoe said the inspectors do not need to inform the employers when they want to do inspection. The National Union of Metalworkers of South Africa have been given a retrenchment letter by the employers of HJA regarding this issue. “The employer must withdraw the letter immediately, failure to do that we will meet with the employers on the street” Phetoe added. 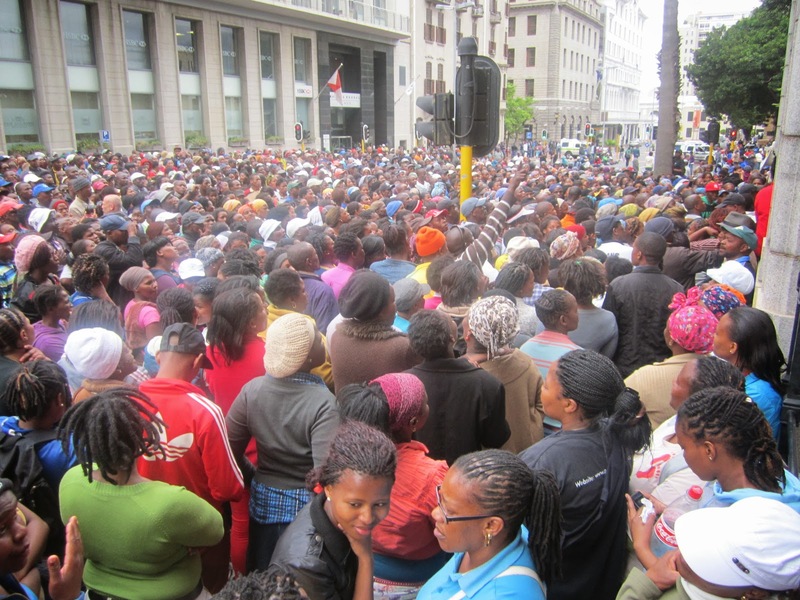 The Democratic Alliance said the high unemployment rate in South Africa is concerning. The Quarterly Labour Force Survey was released on Tuesday and it showed that 3.3 million young South Africans are not in employment, education or training and in total 6.8 million South Africans are unemployed or have given up looking for a job. DA MP of Finance Tim Harris said there have been some jobs created but this job creation has been also most completely neutralized by an increase in the size of the labour source, and increase of 70 000 in the number of job seekers who have given up looking for work. “The bottom line is there are 1 million more South Africans unemployed today, where when Jacob Zuma took office,” Harris added. Western Cape Police arrested a 30-year-old man for being in possession of abalone in Gordon’s Bay on Tuesday. Police have estimated that the street value of the abalone is around R4 million. The arrest was made during an operation by the K-9 sniffer dog unit and the Sea Border Unit. Captain FC van Wyk said police followed a Toyota and pulled the vehicle off the road and started searching it. Inside the vehicle members discovered two plastic bags containing abalone. Van Wyk added that the suspect will be charged on the illegal of abalone and the transportation thereof. He is due to make a court appearance soon. Police in George are looking for assistant in tracing the family of a patient who was admitted to the George hospital and then was transferred to the Groote Schuur hospital. The patient was admitted to hospital after she was assaulted and sustained head injuries of a serious nature, but her family is unknown. Captain Malcolm Pojie said it is believed that she comes from the Wellington region in the Boland she was last seen in Bishop Lavis before she moved to George. "She was arrested for attempted murder and the 49 year-old Marias Botha appeared in court earlier last week, and she was scheduled to appear in court again on the 26th November for attempted murder" Pojie added. Any one with information as to whom her family is or can assist with the identification of the victim can contact Warrant Officer Allie Du Plessis on 044 803 47 62,” Pojie added. 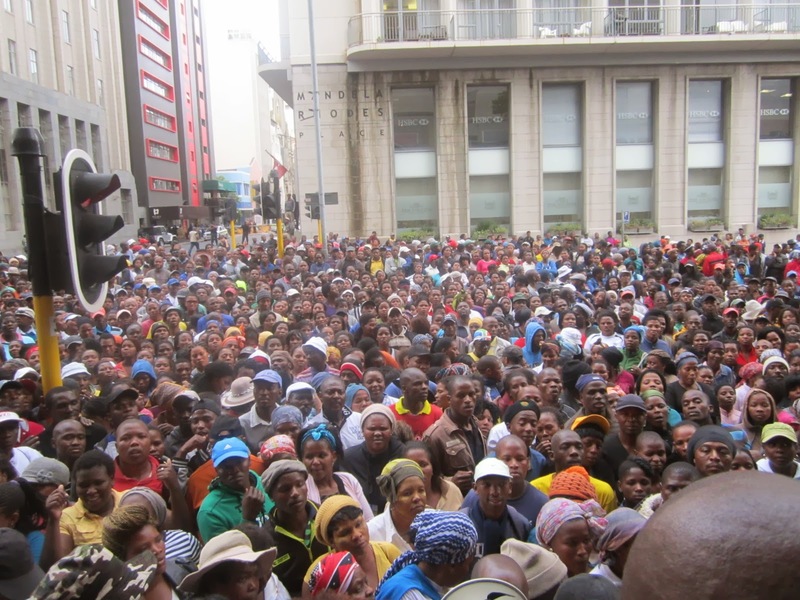 Western Cape MEC of Human Settlement Bonginkosi Madikizela said he is surprised to hear that the group called Ogobityhola Base Kapa are today marching. The group is marching because of grievances they have regarding housing in their communities. MEC Madikizela said the last time the group marched an understanding that the group would provide details of their concern to allow government to respond was reached but nothing has happened since. Madikizela said it is concerning that the group plans to march again today, claiming that they have not received a response. Western Cape Community Safety MEC Dan Plato today met with the Senior Western Cape SAPS Management to discus the allegations that have been levelled against the provincial police Commissioner Arnno Lamoer. The reports were revealed my media reports that Lamoer is alleged to have connections with drug lords. Community Safety MEC`s Spokesperson Greg Wagner said the SAPS organisation is stable, policing on the ground continues unaffected and a good management system is in place to ensure continued stability. Wagner added that the Commissioner was not present in the meeting but his deputy commissioner was present and they assure the MEC that the matter is being looked at closely. Today was the officially launch of the 2014 National and Provincial Elections in the Western Cape. 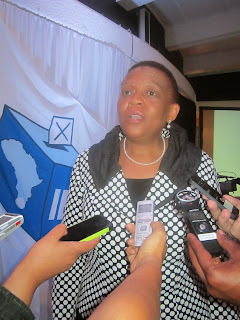 Chairperson of the Independent Electoral Commission Pansy Tlakula said for the IEC the most important and critical thing is to ensure that these elections are fair credible especially as next year marks 20 years of democracy. Tlakula said it is important that the IEC complies with the law and ensure outmost transparency of our processes be it voting at the voting station or be it counting the votes it must be done properly. “I think the credibility of the elections is not only measured by one process but is measured by a whole lot of processes to ensure that indeed the outcome is credible” Tlakula added. Meanwhile Western Cape Electoral Officer Courtney Sampson said to date there are currently 36 registered political parties in the province. Sampson added that the IEC’s concern is the low percentage of young people registered to vote. Provincial PEO Courtney Sampson said they are working with the Department of Basic Education to see what can be done to try and incorporate democracy into the school curriculum. Sampson said the IEC is engaging with the Department of Basic Education in regards with this process. Registration weekend will be on the 09-10 of November 2013 targeted at first time voters and people who have changed addresses. The MEC of Transport and Public Works in the Western Cape Robbin Carlisle said the recent incidents of taxi violence in Delft are caused by illegal operators. Carlisle said on Monday one more taxi driver was shot dead in the area. The violence has been going on for over a month now. MEC`s Spokesperson Siphesihle Dube said these illegal operators are breaking the laws and causing this violence in the area and the authorities will deal with them. Police in Nelspruit are looking for a suspect who allegedly shot dead a 32-year-old cashier and robbed a filling station near Hazyview. It is alleged that the victims were inside the shop with other employees when two armed men entered the shop. The gunmen held everyone at gunpoint, demanded money and cell phones. In the process, they fired shots towards the victims, fatally wounding them. Police Spokesperson Selvy Mohlala said the police are still looking for the suspect and urged the community members to come forward with any information which may lead to arrest and they can contact Captain Robert Khoza on 082 573 5928. A man was this morning hit by a train which was on its way to Strand while he was trespassing into the rail reserve, and he died immediately. Metrorail Regional Manager Mthuthuzeli Swartz said at the same time the accident was witnessed by another driver who was driving to Bellville and he was so traumatized that the train was delayed by 20 to 30 minutes while waiting for a relief driver to take over the train. Swartz urged people to stay away from the railway lines as any incident causes delays to workers and learners, more especially now that the learners are writing exams, they can not afford to be late for their classes. He further appealed to commuters to ensure that they cross at designated areas. Netcare 911 paramedics attended to an accident scene along Marine Drive in Margate where one person died and another sustained serious injuries. It is believed that a heavy goods truck overturned and crashed into another vehicle. “Tragically one man died on scene due to the extensive injuries he sustained another had sustained serious injuries he was treated and then transported to local hospital for further care,” Botha added. The African Christian Democratic Party said it is shocked at the stats by police that there is a trend that is emerging which shows that more children are being killed by their mothers. ACDP MP Cheryllyn Dudley said the culture and laws in the country regarding celebrating a woman’s right to discard her unborn child needs to change. "Once a child is born it creates even bigger problems and if woman feel they have been given a right by society to do what they please with a child then we should be surprised about if these things are happening,” Dudley added. She concluded by saying that ACDP has been calling for the longest time for a change in culture and the legislation regarding abandonment of children. KwaZulu Natal Police on Monday responded to a scene at a school in Dannhauser whereby learners were fighting which resulted in one learner being murdered and two others severally injured. It is believed that the fight started during assembly at Isizimele High School. This happened as more than 700 000 matrics across the country wrote English Paper One. Police Spokesperson Thulani Zwane said when they arrived at the scene they noticed that three people were injured and one of them was rushed to hospital where he later died. “A case of murder was opened at the Dannhauser Police station. 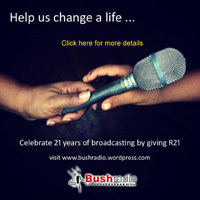 The motive for the attack is not known,” Zwane added. The Department of Social Development said bursaries which the department is offering to study social work its application will close at the end of the month. MEC Albert Fritz said a lack of resources should never stand in the way of a child’s dream. MEC Fritz added that the Western Cape government last year was the only province that made budgetary provision for social work graduates. Fritz said all the learners that would like to pursue careers in social work should keep in touch with the department because from time to time bursaries and learnerships are issued. The Congress of the People Youth Movement has joined the country in expressing its outraged at the mistaken of identity shooting by police of hip hop artist Khuli Chana. COPEYM Secretary General Abel Rangata said the incident shows that more training for the South African police men and women to do proper investigation is needed before opening fire on alleged criminals. Rangata said CopeYM calls on Police Minister to act harsh on police that are not rendering the best service to the communities. Khuli Chana was allegedly shot at by police last night in Johannesburg and he sustained injuries on his finger and back, he has since been discharged from hospital.